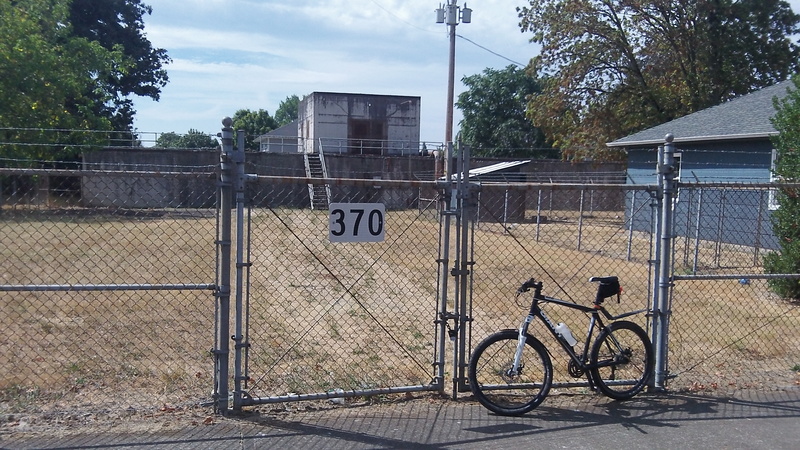 This address on Southeast Burkhart Street is protected by a sturdy wire fence. 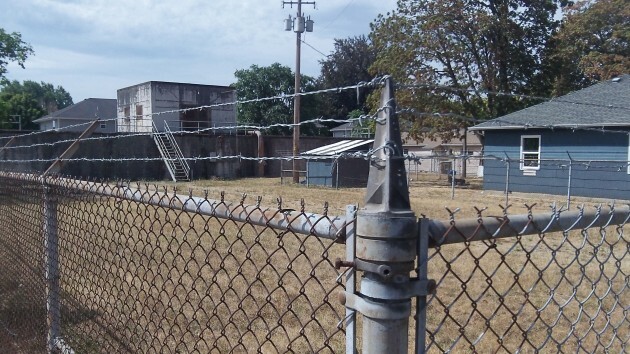 Surrounded by chain link fencing topped by barbed wire, this bunker-like pile exudes a degree of mystery. What goes on behind the weathered concrete? Who climbs those stairs, and why? The answer, sadly prosaic, is that nothing has gone on there for decades, and probably nothing ever will. The other day, Albany residents Mark Avery and his wife, Patricia Eich, took a walk around the neighborhood near Waverly Lake. Having passed this building, they wondered what it was and asked me via email if I knew. I didn’t, but on my next bike ride into east Albany, I detoured into this neighborhood off Salem Avenue and asked a couple of neighbors about the property. The city owns it, said one, but he didn’t know what it was. Linn County tax records easily confirmed the city ownership, but as to its purpose there was no clue. The structure, the Burkhart Street Reservoir, was built in 1963 and could hold 750,000 gallons of water. It has not been a part of the Albany water system for at least 25 years, which is as far back as the institutional memory of the city water department can reach. In any case, Bailey says any connections to the water system were severed when he reservoir was decommissioned. As a bike ride destination, it lacks a certain degree of charm. It is unfortunate that we so quickly lose the history of things. When institutional memory fades so much is lost. Thank you Hasso for helping to keep this history alive. Thank you Hasso for your quick research. Your ability to discover in a short time what is happening in our area is amazing ! I´d think Ms. Bailey (and others) will take a few extra sips of coffee now that she has started looking into it. It’s always interesting to hear/read your web blog. Any follow-up stories about this facility and other articles you have written about are very enjoyable.